CU Pan left, showing A-1H catapulted from *1 catapult.G2) LS pan; four A-1H"s in formation, flying low, off to one side of Ticonderoga. G3) LS Two F-8E"s making approach on Ticonderoga, and firing rockets as they fly by, then banking off to left. VG4) MS ordnance-man loading Zuni rockets in tube launcher on F-8E, on *1 catapult. VG5) MS Three ordnance-men loading Zuni rockets into launch tubes attached to starboard side of F-8E. VG6) LA MCU ordnance-men sitting up on side of aircraft. G7) CU Plane captain cleaning windshield of his F-8E. G8) CU ordnance-man loading Zuni rocket into launch tube. SV VG.9) MS Man pushing 7A rocket pod down flight deck toward A-1H aircraft. G10) MS Man pulling nose cone off 7A rocket pod; A-4E also seen. G11) CU Four men lifting 7A rocket pod and connecting it to bomb rack under A-4E. VG12) CU Man connecting pod to rack under wing of A-4E. SV VG13) MS Group of men lifting 7A pod to center rack of A-4E. SV VG14) MCU Men testing ejector foot for ejecting 7A pod. VG15) CU RF-8A parked on edge of flight deck. G16) CU Name, "USS Ticonderoga, Navy VFP-65", painted on side of aircraft. VG17) CU Markings on side of 7A pod.18) CU F-8E"s spotted in formation on flight deck of CVA-14; plane captains are seen working on aircraft up around cockpit area, cleaning windshields. G19) MS A-4E; men working under starboard wing with 7A pod.G20) MS Three pilots involved in strike on North Viet Nam, walking over flight deck and out of scene to left. G21) MS CDR. D.C. URBAN climbing into cockpit of his A-4E; plane captain climbing up after him to assist. G22) LA CU Commander Urban putting his helmet on, and closing cockpit of his A-4E. VG23) LA CU LTJG D.C. Anderson closing cockpit on his A-4E. VG24) LA CU Pilot in cockpit of his A-4E, adjusting his helmet, and giving thumbs up; he then closes cockpit. G25) CU Nose wheel of aircraft being directed onto catapult. G26) MS Plane director directing plane onto catapult. G27) CU A-4E on catapult; pilot closing canopy. G28) CU Aircraft on catapult. G29) CU Plane director directing plane onto catapult. G30) CU F-8E on catapult, ready for launch.31) MS Men testing cables under F-8E. 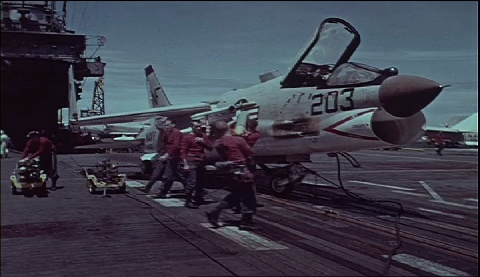 G32) MS Catapult crew attaching cables under F-8E.33) MCU Green shirt standing on deck with his right arm raised. G34) CU Looking up to side of an A-1H taxiing. G35) HA MS A-4E being catapulted from deck of Ticonderoga. G36) HA MLS F-8E being catapulted from deck of Ticonderoga. G37) HA MS F-8E being catapulted from *2 catapult. VG38) HA MS A-4E being catapulted. G39) HA MCU F-8E being catapulted; pan right, showing plane airborne with after burners on. G40) HA CU A-4E being catapulted from *1 catapult. VG41) HA MCU F-8E on *2 catapult; PAN right, showing plane being catapulted, with after burners on.42) HA MS PAN right, showing RF-8A being catapulted and airborne. Chicago: “Vietnam: A Television History; Simulated Tonkin Gulf Incident,” 08/01/1964, WGBH Media Library & Archives, accessed April 22, 2019, http://openvault.wgbh.org/catalog/V_D98FBB022D334F5E948449ABC4D83FFD. MLA: “Vietnam: A Television History; Simulated Tonkin Gulf Incident.” 08/01/1964. WGBH Media Library & Archives. Web. April 22, 2019. <http://openvault.wgbh.org/catalog/V_D98FBB022D334F5E948449ABC4D83FFD>.